The recent banking crisis and the failure of the Scottish attempts to take over the banking world in the UK two years back has set me thinking about the earlier attempts at setting up regional banks and in particular the setting up of the first real retail type banks in the UK. Many years ago numerous county banks were created in different parts of Britain, including Gods Country Wales. There were a number of so called drovers’ banks set up in mid-Wales at that time. Drovers as in ‘rawhide’, the famous cowboy series took the cattle (and sheep) to market and returned the money from the sale to the farmers – which could mean they had quite a considerable sum of money on their person. They would set off with chuck wagon, outriders etc. and fighting off Indians and Brumies would travel the some 180 miles to market to sell their stock. This growing trade with London’s Smithfield market demanded a relatively secure way of transmitting bills of exchange – i.e. bank notes. 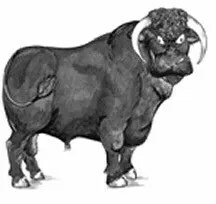 One such example was the ‘Black Ox’ drovers’ Bank set up by David Jones of Llandovery in 1799 in the tap room of the Black Ox Pub where the deposits were kept in the coal scuttle behind the bar. The notes depicted the Welsh Black breed of cattle as the motif (shown below) – definitely a better idea than some second rate prince or monarch we now have to put up with nowadays. This Bank is claimed to be the first (real) bank in Wales founded by the drovers John Jones and David Lloyd although I cannot confirm both these names – The bank originally occupied The Black Ox at Llandovery, and later on had premises at The King’s Head inn from 1799 – 1848. An interesting side note on this bank is it later became the Lloyds Bank we all know and love as a main street player in the UK and taker of vast sums of tax-payers money in bailouts. A little earlier in Aberystwyth in 1762 there was a bank formed in the same year a customs office opened in the town, a bank called Banc y Llong (the Ship Bank), followed by a bank known as the Black Sheep Bank because of the picture of a sheep on its notes being chased by a shepherd with his trousers down. There is an example of a note shown below (no shepherd in this version). In 1825 a crisis occurred which saw the collapse of many private banks across the country. A major factor was the over-issuing of notes and the allowing of debt to spiral out of control such that the sum total of the issued notes could not be honoured if they all came in for payment together. Other contributory factors included a tighter fiscal policy by the London banks a latter day ‘credit crunch’ and bad speculation in the booming industries in the north of the country coinciding with a slump in agriculture. I think this is surprising for the parallelism with what has gone on recently. The collapse of one or two banks caused a run on the others creating a ‘domino effect’ and general panic set in – there were runs on the banks! There are numerous stories from this period about the ruses used by the banks in an attempt to allay the panic. Staff would haul large sacks of scrap metal across the bank in full view of the customers, the sacks having a handful of gold coins on the top to make it appear that the bank had large funds. Nowadays we do this by pumping huge sums of taxpayers money by the European Central Bank to make out the banks in Spain for example are stable and we have Major Merkosy telling us not to panic as they have everything under control so the similarities could not be more obvious. That is so true Royston. As an author and business man, I can relate to how you said “There are numerous stories from this period about the ruses used by the banks in an attempt to allay the panic”.I hope more people discover your blog because you really know what you’re talking about. Can’t wait to read more from you! Bank Crisis of this time were also far more intense in their ramifications than they are today simply because all big business during this time were banks. If you look at the top US companies as well during this same period they are 9/10 banks. When all of a countries ‘eggs’ are in one industry (basket) citizens are definitely exposed to much more extreme conditions when some collapse.